!NOTE: First find the pattern you want to save. Turn Off Shuffle Mode to make sure you are in Single Pattern Shuffle. *TIP: Start Hoop in single pattern shuffle mode to see if this is the pattern and the settings that you want to save. Example: Color Wheel Option is Rainbow. Strobe Mode is On and option is Single Color Strobe. *LEARN: 25 Empty Slots are shown as White Pixels on Hoop, Yellow Pixel Slots have a Pattern Saved, Green Pixel is your Pointer. You can override or save your current pattern into any Slot. 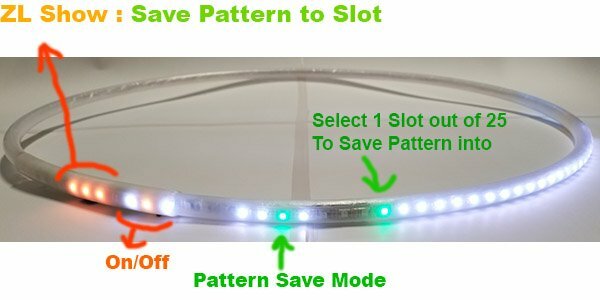 The hoop will automatically delete the previous saved pattern and save your new setting.